I’m sure many of us watch the Sport Relief programme on the day and see all the wonderful places both at home and abroad that are supported by Sport Relief fundraising. I even watched my good friend Penny blog about her experiences when she visited Ghana last year with Comic Relief and saw where the money had gone, and how it had helped to turn people’s lives around. But I’d never visited one of these supported charities for myself. Did you know you are never more than 30 miles from a Comic/Sport Relief funded project in the UK? Last week I had the honour of visiting Hope Nottingham, a project dedicated to helping individuals and families who are struggling with their needs for food and furniture. I blog regularly about homes, about furniture and decorating in such a different way so this project seemed an obvious choice for me. I went along with Penny from Alexander Residence and together we learned where the Comic Relief money goes. 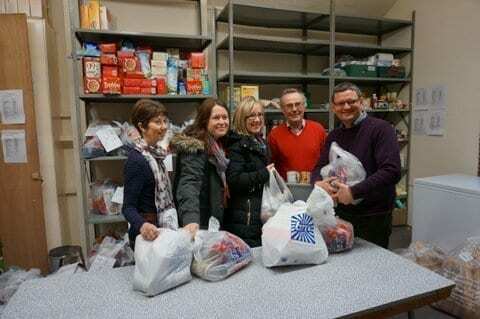 I was told Hope Nottingham is a foodbank and soup kitchen, but found out that, in reality, it is so much more than this. Food is such an essential, such a basic right in this country but any of us could find ourselves in need of a project such as this. Any of us could find ourselves needing support and help to feed the family on a weekly basis, particularly in light of recent economic events, and as incredible as this is I was overwhelmed by the other outstanding services on offer at Hope Nottingham. This project offers a friend to someone in need. It offers trust, practical support and a community. It is a place where no-one is turned away; it is warmth and comfort in so many ways. Nigel set up Hope Nottingham around 2 years ago and in that time is has developed and grown incredibly. 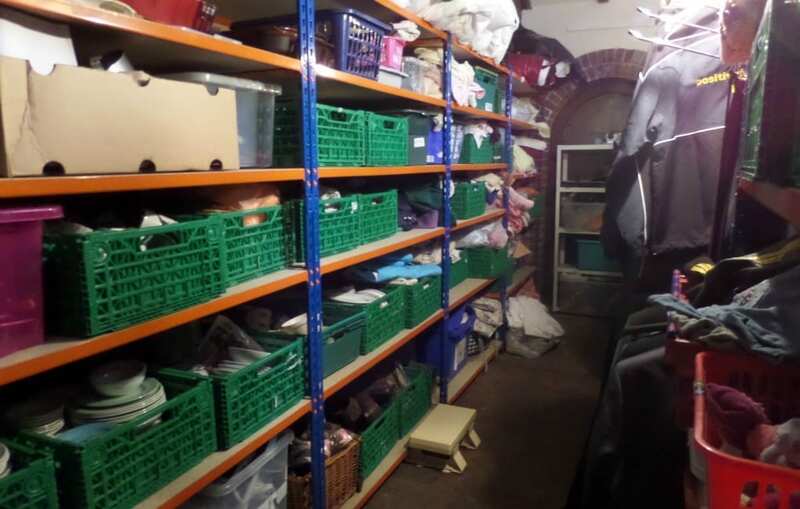 Now with 5 members of staff, over 350 volunteers and 13 foodbanks across the city, Hope Nottingham is providing support, help and guidance in abundance. The energy and vision is inspiring, and the look of pride and reward on volunteers’ faces as they talked about meeting clients’ needs was heart-warming. We met several people there who were willing to share their story. We met the lady who, at first was uncomfortable with our presence, thinking we were there to look down on them and patronise their situation. Once she knew we were from Comic Relief and were bloggers trying to raise funds and awareness of the project she was more than happy to tell us about how Hope had helped her in the last 2 years, and how she had introduced countless others to their services. There was the young man, his girlfriend and 3 month old baby. He had spent 6 years in prison, suffered with ADHD and mixed in the wrong groups. Hope had sent out volunteers to improved the decor of his girlfriend’s house and had donated furniture to make it more habitable. They had helped find him a work experience course, and supported the development of is IT skills. The visiting GP has now become a friend; something that would never have happened without Hope. It sounded like this young man was turning his life around with help, community and support. The alternative could have been so different. We also met another gentleman who had experienced the worst kind of year and was now homeless, living in his Camper Van with no heat, no hot food and no lighting. Hope Nottingham gave him access to showers, to washing machines, helped him fill in forms, use the phone and generally gave him friendship, comfort and a lifeline to the outside world. The GP had even been to the van and helped jump-start it at one point. The visible emotion with which he spoke about Hope was touching, and we came away believing that this gentleman will have a much better year in 2014. It’s projects like this, supported by Comic Relief money that makes such a difference to people’s lives. And they are right on your doorstep. With the recent floods there are so many people in need in the UK, and the money you donate goes directly to them, helping them get back on their feet. Next week I’ll be walking to Derby, taking part in a 3000 mile Team Honk Blogger Relay for Sport Relief. We’re hoping to raise £20k but at the time of writing we’re already at £18k which is astonishing. We’re only half way through! 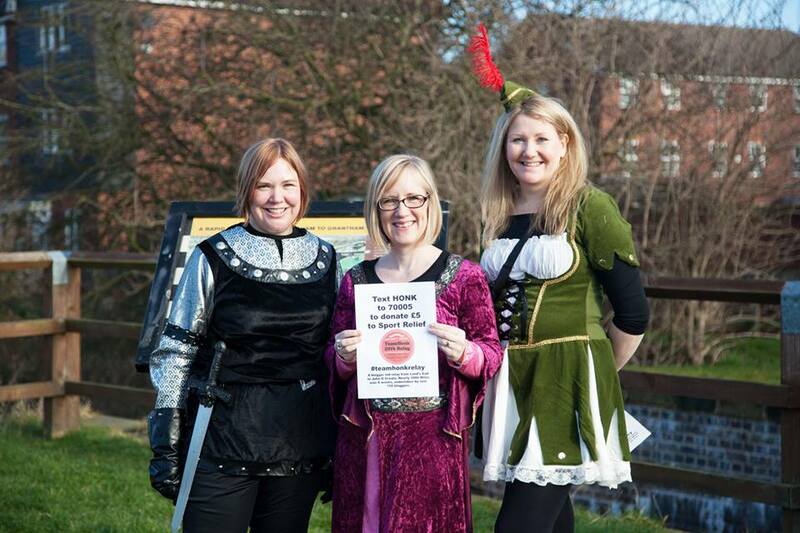 In the spirit of Nottingham and Robin Hood, we will be in fancy dress too with costumes kindly donated by joke.co.uk. Having seen a local project that benefits from the money we raise in events like Team Honk, I’m more inspired to ensure I do my bit. If you would like to find out more about Hope Nottingham you can do so by visiting their website. You can also sponsor me in my leg of the Team Honk Blogger Relay here. It doesn’t matter how much or how little you can afford. Every £1 counts. I have shared this post, it is fantastic and very inspirational. Thank you for sharing the good work that the money from Sport Relief goes to, it makes me feel even more proud to be a part of Team Honk. Wow, that sounds like an amazing project. I can imagine how that helping hand in people’s worst moments can make all the difference in the world. Sports Relief do a great job, it’s fab to find out where the money goes, thank you! I can imagine how that helping hand in people’s worst moments can make all the difference in the world. Pingback: Sport Relief: Team Honk Blogger Relay - it's our turn! Thanks to Sports Relief for coming forward and lending a hand of support to all these needy individuals. Many of such projects have been planned, but very few have succeeded in achieving what lies in their agenda. The common man’s money is indeed being used for a great cause! Great job! Sports relief is really a good campaign giving hands to the needy at the right time and encouraging their sport activity with whatever they required. Really a great cause!